Clearance measurement was never this easy and convenient: The 1 to 7 gas detector detects toxic and flammable gases as well as vapours and oxygen all at once - either in pump or diffusion mode. Innovative signalling design and handy assistant functions ensure complete safety throughout the process. Specially designed for use with a pump, optimised for clearance measurement The X-am 8000 is equipped with a very powerful pump. It can be connected with hoses of up to 45 metres in length. A pump adapter makes it easy to switch between diffusion and pump mode at any time. This means the pump is only operated when you actually need it. That saves energy, reduces wear and tear, and thereby extends the lifespan of the pump. Handy and durable, the X-am 8000 is intuitive to operate single-handedly using three function keys. The easy-to-read colour display clearly lays out all the information for you. Standard accessories include a sturdy shoulder strap, so you can comfortably carry the X-am 8000. Thanks to its compact and robust construction, the device can withstand even the harshest conditions. The X-am 8000 effectively supports various applications with specially developed assistant functions that guide you through each process step by step. During clearance measurement, for example, the smart assistant calculates the necessary flooding time for the device and probe (FKM hose) based on parameters such as measuring gases, temperature limits, and the indicated hose length. When monitoring for possibly high methane concentrations, an optional automatic measurement range switch makes it easier to take a reading: if the Cat-Ex sensor measures values above 100% LEL, the display switches to the range of 0 to 100 vol%. An additional useful tool is CSE Connect. It combines an Android app, specially designed for the X-am 8000, with a cloud-computing solution. Measuring jobs can be quickly and easily transferred to the app using an online application. 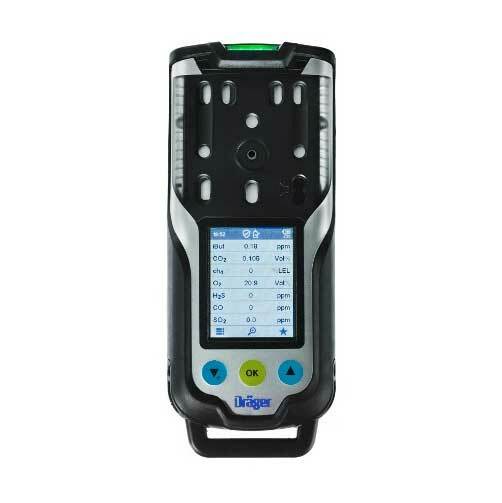 An optional Bluetooth module in the X-am 8000 enables measured values to be transferred automatically to the CSE Connect app. You can also easily and conveniently use the app to create measurement reports. This saves time and helps you manage your measuring tasks during clearance measurements more efficiently. Bumptest and calibration are carried out simply and quickly using the X-dock calibrating station. Its low test gas consumption keeps operating costs to a minimum. Its reporting function and numerous other useful features make the X-dock Manager PC software a smart addition to any fleet management operation. To identify the devices in the fleet, you can either use tried and tested barcodes or an integrated RFID transponder. The X-am 8000 features inductive charging. This makes it easier to operate and increases the lifespan of the device. Issues like corrosion and contact problems in the charging cradle are a thing of the past. You can charge (outside of explosion-hazard zones) and measure at once, e.g, when in use inside vehicles or on machinery. The charging cradle can connect with one another, taking up minimal space, and are compatible with existing X-am series cradles. The green glow of the D-light allows you to see from a distance whether the device has been properly tested and is ready for use. In case of an alarm, the X-am 8000 alerts you with colourful alarm LEDs, a loud horn (100 dB(A) at a distance of 30 cm), and clearly palpable vibration. Optionally, four preset hazard symbols are available for the display which explicitly indicate the presence of explosive or toxic gas hazards, for example. This allows the user to easily recognise the type of hazard based purely on the symbol displayed. The X-am 8000 is equipped with an impact detection system. The event report indicates whenever severe mechanical impacts have occurred that might result in functional impairments of the device or the sensors. These are also documented in the data logger. With this information, a device attendant can specifically check the device. To measure hard-to-detect hydrocarbons, you can fit the X-am 8000 with one of two high-performance PID sensors. The PID HC covers a measurement range of 0 to 2,000 ppm (Isobutene). The PID LC ppb is particularly suited for a measurement range of 0 to 10 ppm (Isobutene) with a high resolution in the range below 1 ppm. For benzene-specific measurements, the X-am 8000 can be used with a pre-tube. The advantage: you only need one measuring device for this application, which significantly reduces the costs of purchasing, maintaining and transporting devices in use. The use of the pre-tubes is supported by a built-in assistant. Incl. adjustable alarm levels to country specific standards. At least one sensor must be chosen. Identical to Drager X-am 8000 incl. Li-Ion battery, shoulder strap, manufacturer certificate. Without pump, sensors, inductive power unit, power supply. Drager X-am 8000 Basic Pump Identical to Drager X-am 8000 incl. Li-Ion battery, pump, pump adapter, shoulder strap, manufacturer certificate. Without sensors, inductive power unit, power supply.